Six inches long. Brown and white streaks back across the crown, brown and black speckles in streaks over its breast and sides of its white underside. Brown and black wing feathers with white borders. Gray tail. Inhabits woodlands, groves, wetland edges, open country, farms and vacant lots in towns from southern Alaska across Canada below 60 latitude to Newfoundland and throughout the U.S. to central Mexico. Most migrate short distances, some remain resident year around. Eats grains, insects and fruit. Likes bird baths. Pumps its tail in flight and characteristically disappears into bushes. Always flies downward when alarmed. Builds a well concealed nest of grass, rootlets, bark shreds and leaves lined with fine grass and hair in trees, bushes, trunk cavities, wood heaps and in vines against sides of houses, usually near or on the ground, sometimes up to six or eight feet, sometimes in open fields. Lays four to six, more or less, white speckled eggs which hatch after about two weeks incubation and young leave the nest in about another week and a half. Raises two or even three broods in a season. 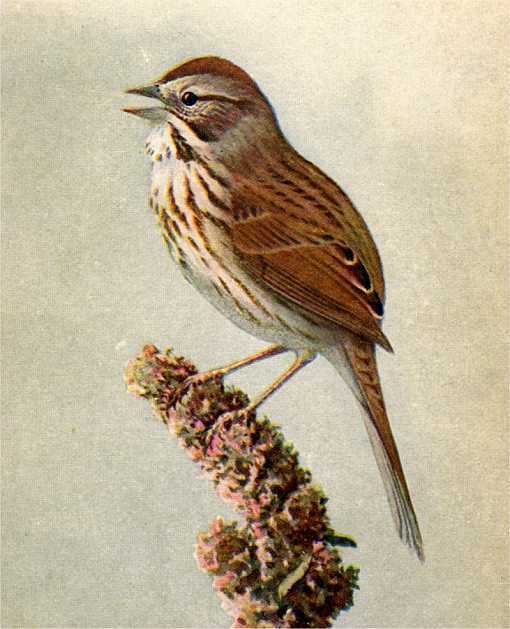 Gilbert H. Trafton, the author of “Bird Friends”, 1916, recommended platforms open on all four sides for Thrashers, Catbirds and Song Birds. Chances are probably slim of attracting song sparrows, catbirds and brown thrashers to any particular shelf. Another alternative is something similar to the concave shaped cups made of mesh some people have made for blue jays. Attach corners to branches creating a trampoline effect and conceal in a bush. Use a net made from natural cloth material, not metal mesh. 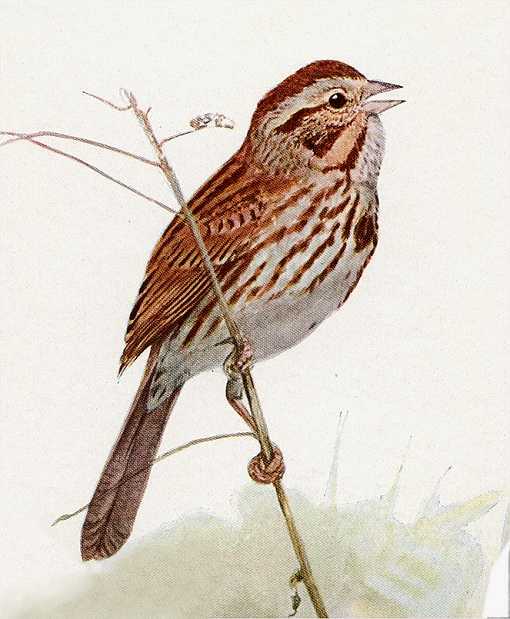 Attract song sparrows naturally with bushes that produce blackberries, blueberries, mulberries, poke berries and bayberries. Also plant black cherry trees, Virginia creeper, and wild grapes.